The designer duo Scholten & Baijings has designed Hay a collection of colourful tea towels woven in cotton blend. 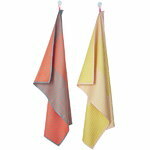 The designers are known for their bold use of colours and the S&B towels will brighten up any kitchen. The tea towels feature a simple graphic pattern and come in sets of two – one has a vibrant hue and the other one a calmer colour palette. Scholten & Baijings consists of Stefan Scholten and Caroline Baijings who are an Amsterdam-based designer couple, who is especially known for the talented use of colors and the carefully thought-out details. Scholten & Baijings have designed for several manufacturers like Hay, Karimoku New Standard, Established & Sons and Thomas Eyck.